Gladys was born in Burnley in Lancashire on April 13, 1917. She lived there for many years with her parents Harry and Florrie Williams. She married Robert Wolfenden an Air Force Officer in 1945 and set up home in Burnley. Gladys had a passion for fashion and owned two high street boutiques one in Burnley and one in Palm Bay Margate. She would design as well as model her own clothing.. One of her favourite things to do was to create wonderful window displays and her mannequins were the talk to the towns. Gladys must have some amazing genetics because she has outlived all of her immediate family. She does have some cousins left but they live in Australia although they call her a regular basis. 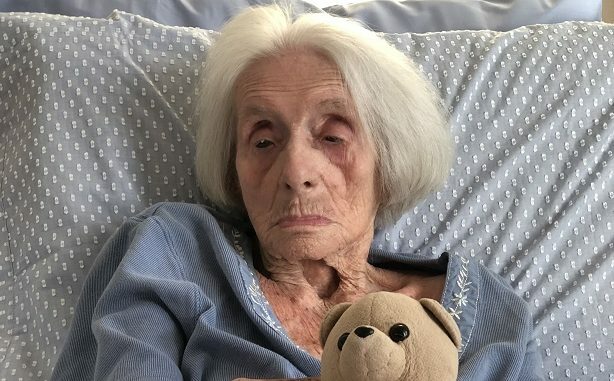 Gladys moved into St Peters Home in Margate in November 2014 at the tender age of 97. The home has invited Sir Roger Gale MP to visit Gladys today to wish her a happy birthday. George V was on the throne and the Prime Minister of the Coalition government was David Lloyd George. Winston Churchill was appointed Minister of Munitions. Happy birthday Glad. You don’t look as if you are celebrating cheer up. Happy Birthday Gladys. The very best of wishes to you.